Full details of the EnviroMonitors product range will be found on our dedicated <a” href=”http://www.davisenviromonitors.com”>Davis EnviroMonitors website. Some introductory information is provided below for completeness, but see our main EM website for more complete details and please feel free to email or phone for further information – EM is a system with many available options and typically needs a custom specification and quotation to arrive at the most cost-effective solution. Prodata Weather Systems is the only UK dealer to have been involved in the beta-testing of the new Davis EnviroMonitor range . As a result, we already have in-depth knowledge of the EM range and can offer unrivalled insights and advice into applications made possible by this exciting and cost-effective new system. EnviroMonitor (EM), as its name suggests, is a new and highly flexible system able to remotely monitor many physical aspects of the environment, both outdoors and in other settings such as greenhouses. Data readings include weather (of course! ), soil conditions and several other environmental parameters such as water level, flow rate, water pressure etc. Additional sensors are planned for the future. Data is uploaded to a cloud platform and all readings can be viewed and analysed via an innovative, modern, browser-based interface that’s equally at home on PC or smartphone app. 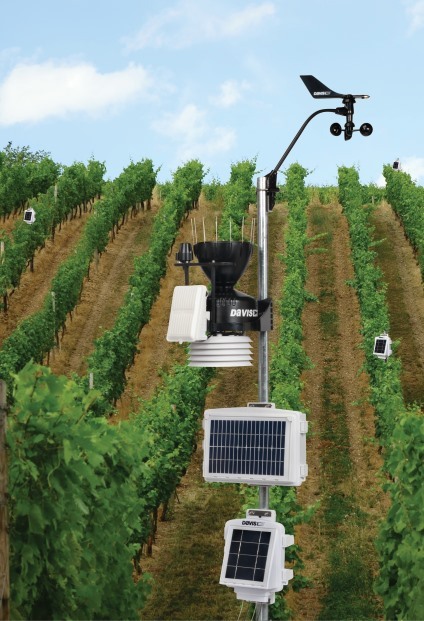 Agriculture is the most obvious sector to benefit from EnviroMonitor, but any application that requires state-of-the-art environmental monitoring is also likely to find EM valuable. To be clear, EM is complementary to the existing Davis Vantage range of weather stations, and does not replace or supersede them. EM is intended for more extensive and more sophisticated applications than the Vantage stations can easily provide for; in particular, while EM uses various weather sensors from the VP2 range, it can also accommodate a much wider range of third-party sensor types and many more sensors can be fitted to a given installation. 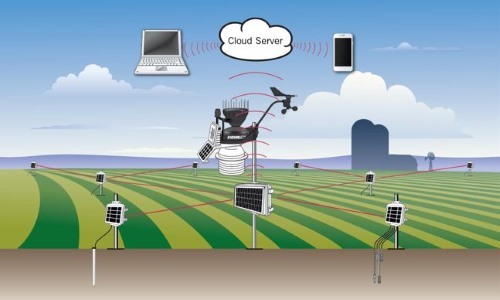 In addition, EM also includes many features designed to assist with the management of crops and other environmental applications such as a complete set of alarm thresholds and notifications by email or text, all configurable remotely. 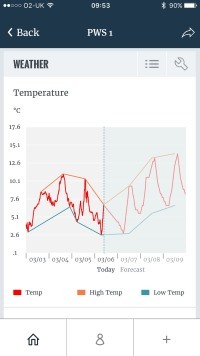 In addition, the Mobilize module and app provide powerful weather forecasting features. The EM system is based around three types of component: gateways, nodes and sensors. These various components are assembled to form a mesh network as per the schematic below. In outline, the gateway acts as a hub for a local set of nodes, with gateways uploading all data into the cloud to a totally new area of the Davis Weatherlink.com platform. All data flows initially up into the cloud via the mobile phone network, and users can immediately view the data across the Internet on a smartphone or tablet app or PC browser (i.e. there is no concept of a dedicated local display console as with a Vue or VP2 station). EM is therefore more like a Davis Connect system in concept, but with considerably enhanced data handling. Since EM uses the mobile network, each gateway needs an annual data plan with options of 5, 15 or 60 minute updates in a similar way to the Davis Connect plans. Communication between gateways and nodes is via a ZigBee wireless mesh, while sensors are all cabled to their nearest node. Gateways and Nodes are fully weatherproof and solar-powered and so are fully autonomous units suitable for installation anywhere on an exposed site, subject only to wireless range/reception considerations. Configuration of a new EM system is performed onsite by means of a separate EM smartphone app (both Android and iPhone versions available) which communicates directly with gateways and nodes via Bluetooth. More details of the hardware components and data-handling will be found on the EM Components and Data page. EnviroMonitor continues the established Davis proposition of combining professional features and performance with genuine value for money. We expect that EM will always offer significant savings relative to potential competitor products. Because every EM installation is likely to be different (with varying numbers of nodes and almost limitless combinations of sensor types) each installation will typically need a custom quotation. Please contact us to discuss any proposed installation in detail – we will be delighted to talk through the optimum EM solution for your application and to draw up a detailed quote on request.